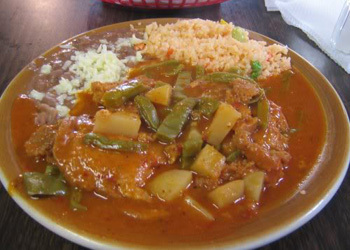 Here is Aurora Guerrero's delightful Lenten specialty, Tortitas de Camarón con Nopales (Shrimp patties in light mole sauce with cactus pads.) Only fresh ingredients are used for that perfect taste. We hope you try this traditional meatless dish. If cooking is not your thing, you can always come into Las Anitas and enjoy this delicious dish in the company of family and friends. Prepare mole by soaking the uncooked dry Chile pods in cold water for about twenty minutes. Rinse and pull stem to drain seeds. Rinse again in cold water. Boil for 10 minutes till soft and bright red. Drain. In a blender put cooked Chile pods, chicken broth, corn starch, salt, ground cloves, and garlic and blend till mixture is completely pureed. About four minutes at high speed should do it. Strain through medium sized strainer to remove any seeds or unpureed pieces of chili. Add a little more broth if needed for blending. Heat 1 tablespoon of vegetable oil in large sauté pan and pour in mixture. Add dry shrimp. Simmer for 20 minutes and set aside. Taste for salt and pepper. Buy the already cleaned cactus paddles unless you know how to cut out the thin thorns. Cut into 1x 2 inch strips. Bring 4 cups water to a boil and add cactus, salt and onion Let simmer for about 3 -4 minutes or until tender. Rinse well in hot water. Drain and rinse in cold water. Remove onion. Set aside cactus. Prepare shrimp patties by separating egg whites and beating with electric egg beater until stiff peaks appear. Gently fold in egg yokes. Fold in dry shrimp and flour. In a frying pan heat 1/2 cup of vegetable oil. Using a tablespoon, drop prepared batter into hot oil. Turn each patty when golden brown. Drain on paper towels. Makes about 8 Tortitas or patties. Heat mole to a low simmer and add patties and cactus. Let simmer for 5 minutes. Serve in shallow soup bowls. Offer with corn or flour tortillas and add your favorite hot Chile sauce for those who like their dishes spicy. Served at Las Anitas only from Ash Wednesday through Palm Saturday (the 40 days before Easter Sunday).